Cheerful Madness!! 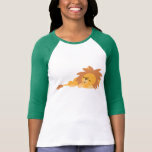 : Cute Slumbering Cartoon Lion Women T-shirt Cheerful Madness!! Cute Slumbering Cartoon Lion Women T-shirt Cheerful Madness! !